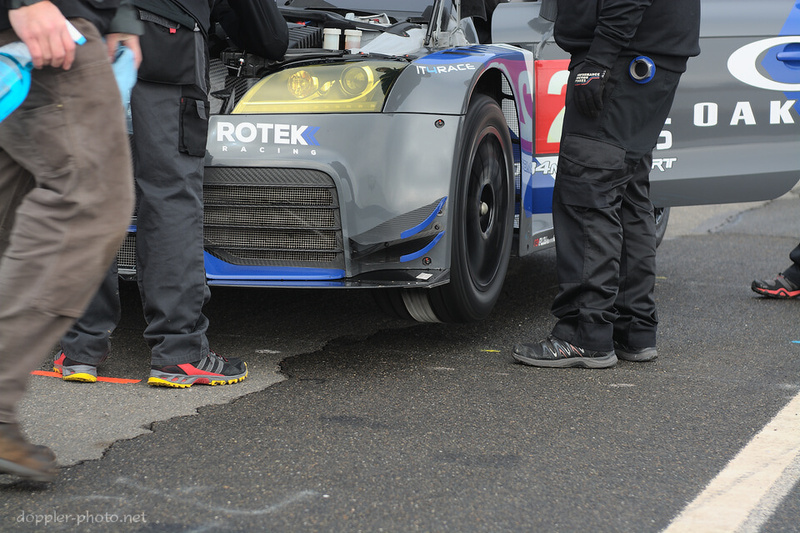 25 Hours of Camaraderie, the conclusion: After 25 hours of racing, the Rotek Racing #24 Audi TT-RS claimed the overall victory, with a 28-lap margin of victory. But as is often the case, what's particularly interesting isn't what they accomplished, so much as how they did it, and in my own case, how I came to witness that victory. Let's rewind. 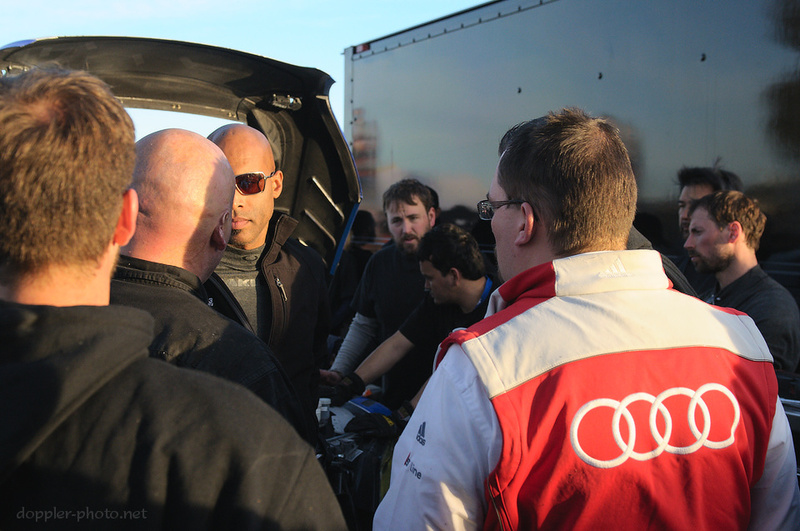 Driver Robb Holland (in sun glasses in the photo) wrote a piece for Jalopnik about an awesome, one-off Audi TT-RS racecar. 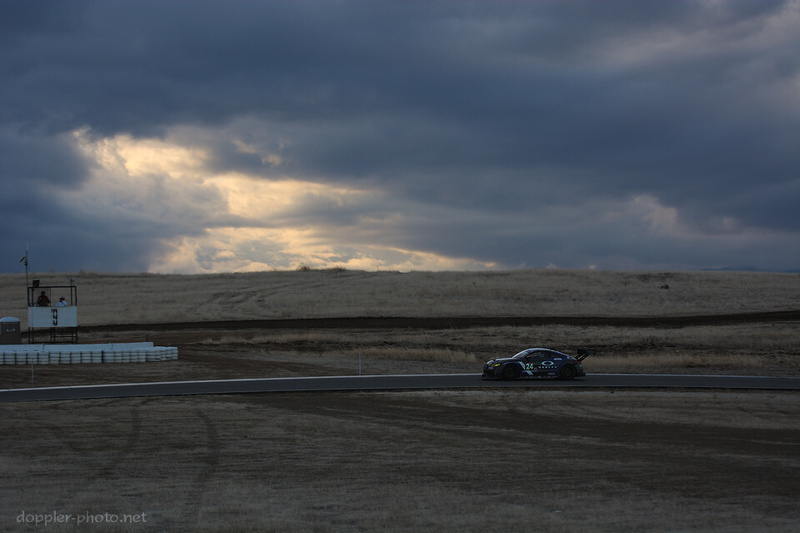 I had been meaning to check out the 25 Hours of Thunderhill race for awhile, and given that this would likely be my only opportunity to see the car, I decided to spend a night at the racetrack in December, 2012, a scant 3 days before my wedding. So I went, cameras in tow, and the experience was amazing. I got to watch that awesome racecar, and a little later on, I was watching as the fire-suppression system deployed following a mechanical problem with the transmission. Uh-oh. The transmission was a one-off, and after getting the car back to the paddock, the team judged that the problem was irreparable. And so as I watched and photographed back at the pits, the team decided to call it quits for that year. A year later, they were back. Different livery, different title sponsor, but the same car, and a lot of the same people. Once more unto the breach, dear friends. So as they warmed up and got ready to race, I kept an eye out and kept my fingers crossed. As the first day of racing wore on, the #24 seemed to be doing pretty well. 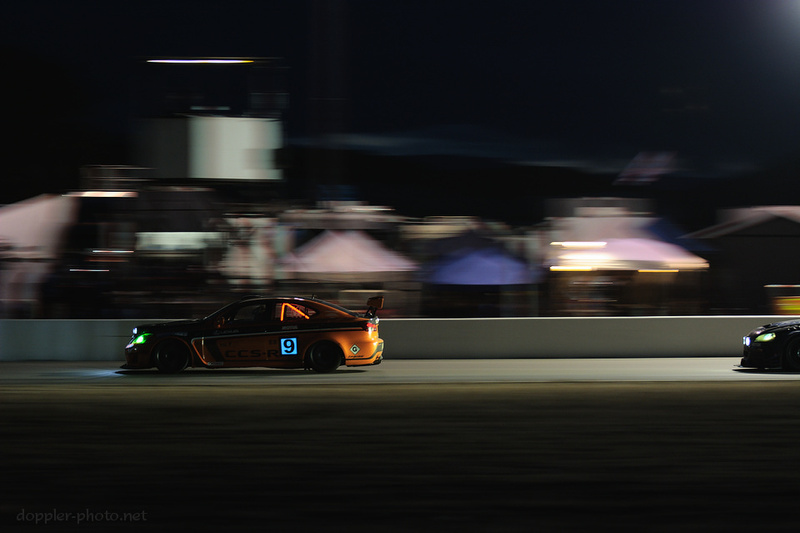 The early sunset would find the team running fourth overall, among a pack of around 12 cars that remained within 10 laps of the lead, after the first 5 hours of racing. To be clear, the early phases of an endurance race aren't about exact positions, so much as about staying within striking distance of the cars ahead, and maintaining a sufficient buffer from the cars behind. Mistakes and mechanical issues will happen, and you want to be able to capitalize on those opportunities when they happen to other cars, without pushing so hard that you give another team the opportunity to capitalize on your own mistakes and breakages. In the photo, the #24 pursues the #9 Lexus USA IS-F, attempting to add another lap of buffer to the Audi's still-meager 4-lap advantage. By Sunday morning, the team had built that into a 30-lap advantage over any other car in the race. 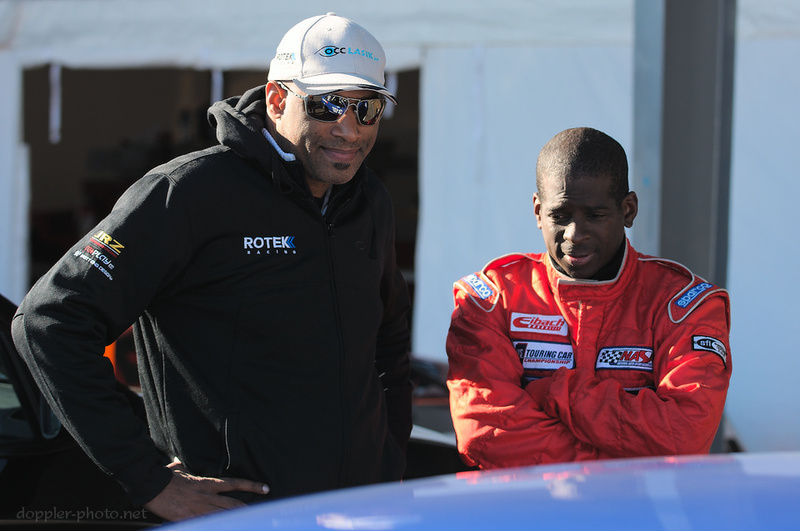 In a stark contrast to his stressed and somewhat dejected demeanor the prior year, driver Robb Holland (left) appeared relaxed as he talked with Dale Sievwright, a driver for the #31 Hankook / El Diablo Motorsports BMW M3. 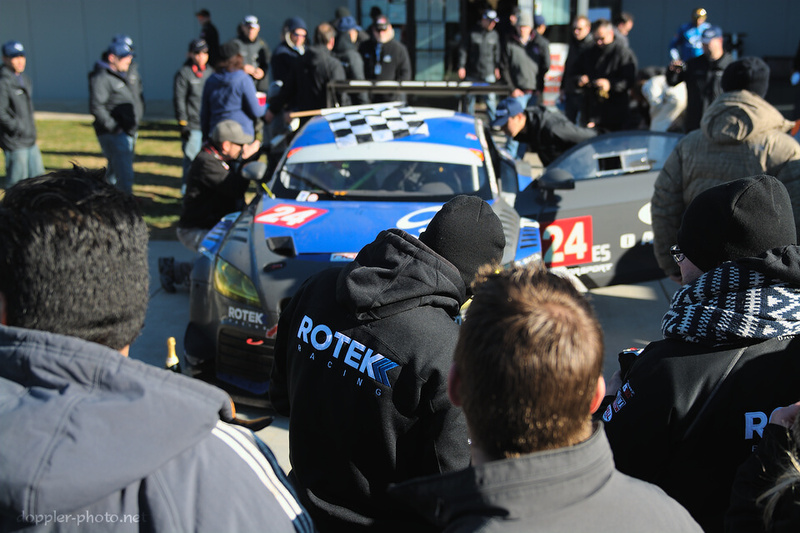 The Rotek team would go on to maintain their lead as the checkered flag fell. In the 25 Hours of Camaraderie introduction, I described camaraderie as a blend of teamwork and friendship, where your coworkers are also your family, in a sense. Friends always have some shared history — shared experiences — and that common foundation is an aspect of what makes those relationships special. 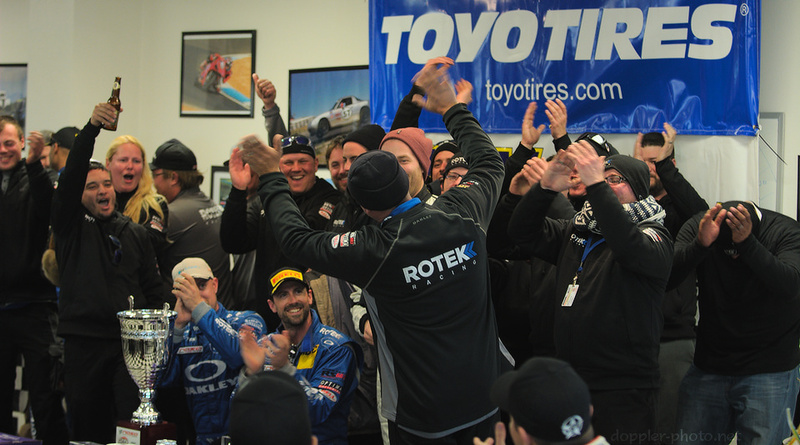 For Rotek, victory was sweet, but I'm confident that in light of the prior year's result, it was even sweeter. I can say for certain that after being present for 2012's untimely end, I appreciated this moment a little bit more as well. And what better way for friends to celebrate than by singing happy birthday to a teammate, from the top step of the podium? Yes, I sang too.